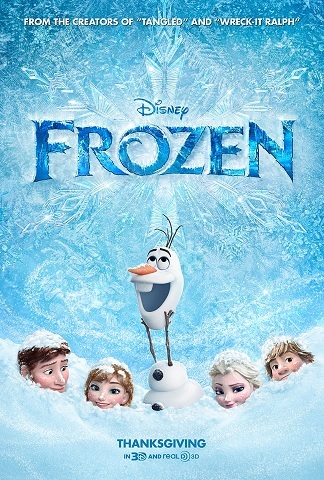 As stated on its credits, the movie is loosely based on the story of Hans Christian Andersen’s The Snow Queen. However, they do differ a lot. Frozen is about the two princesses of a fictional kingdom called Arendelle: Elsa and her younger sister, Anna. The two used to be very close, but because Elsa had to hide her ability of creating ice and snow at will, they grew apart. They did not see each other for years until a tragic accident concerning their parents led them to. Elsa is to be crowned the queen and so, a banquet in the castle had to be made. Anna met the prince she wanted to marry and yet Elsa was against it. They argued, which led Elsa to lose control of her powers, making everything in the kingdom covered with ice and everyone freezing with cold. She departed to the mountains where she built her ice castle. What will happen to their kingdom now that they have separated? Will the sisters find their way again to each other? That’s what you have to find out. The movie boasts itself with great animation and good visual effects. The combination of hand-drawn pictures and computer-generated imagery (CGI) effects made a spectacular display of animated sequences. You’ll be amazed by how some things onscreen are too detailed, with the lighting and the ice crystals and the snow. What makes Frozen even the more impressive is its music. It’s not a good animated musical film for no good reason at all, right? The songs used are written and composed by Filipino songwriter, Robert Lopez, and his wife, Kirsten Anderson-Lopez. Their songs, incorporated into Christopher Beck’s musical score, made the audience either glee or moved depending on the scene. You’ll never wonder why you’re still smiling or even humming or singing right after watching because of the wonderful music heard in the film. Thanks also in part by the great voice work of its cast (who also sang) led by Kirsten Bell and Idina Menzel. The movie teaches a number of good messages (e.g. Never marry a man you just marry), but the best for me, though, is how it showed a true act of love. I will not spill, but the movie’s climax pointed out a very strong message to everyone, that love isn’t what people always seem to believe.